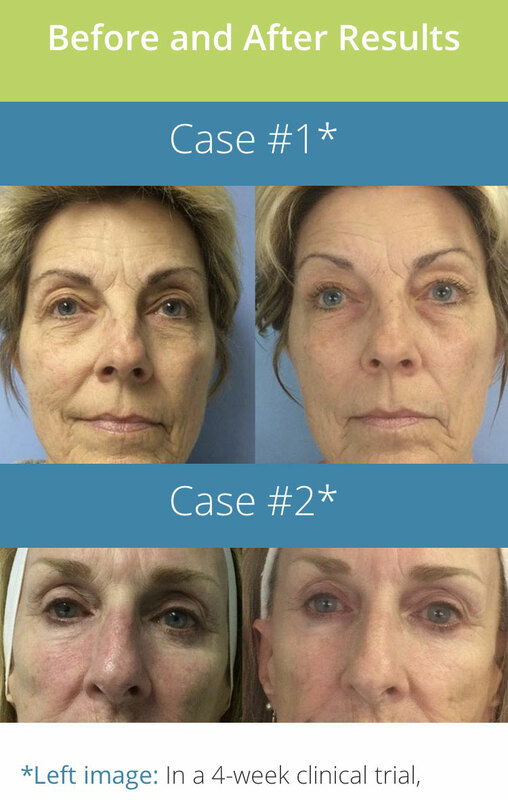 Facial plus microdermabrasion (utilizing Superior Bella System Microdermabrasion). Helps fight acne, hyperpigmentation (age spots), and lines and wrinkles. Stimulates cellular metabolism to boost collagen and elastin production. Facial plus peel (choose from enzyme peels or AHA/ BHA peels). Peels address a variety of conditions: detoxification, acne, hyperpigmentation (age spots), wrinkles and fine lines. Boost the effects of your microdermabrasion by adding a peel! (many types of peels available: pomegranate, blueberry/lactic, glycolic, salicylic, jessner, tca(10 & 15%). Don’t worry, your therapist will help you choose which peel to achieve the results you want. Adding a peel to your treatment will not only increase the benefits, but will make the results last longer. LED FACIAL: $45 (30 min. LED time, 45 min. total. Package of 6: $225) Add this to any facial or body treatment: $25 add on for 15 min., $45 add on for 30 min. 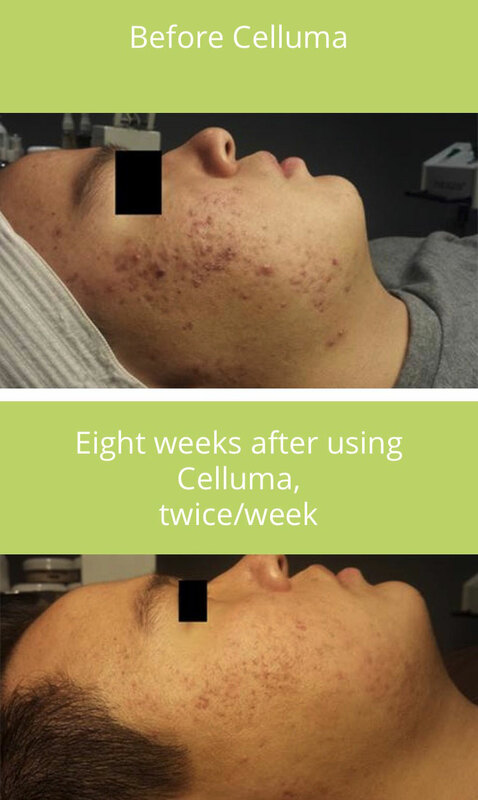 LED Phototherapy is used for Acne Vulgaris, and also reduces the appearrance of pigmented lesions from acne scarring, improves tone and texture, reduces the appearance of lines and wrinkles, and helps boost collagen and elastin production, improving the firmess of the skin. Treatment includes cleansing, LED, and application of sunscreen. 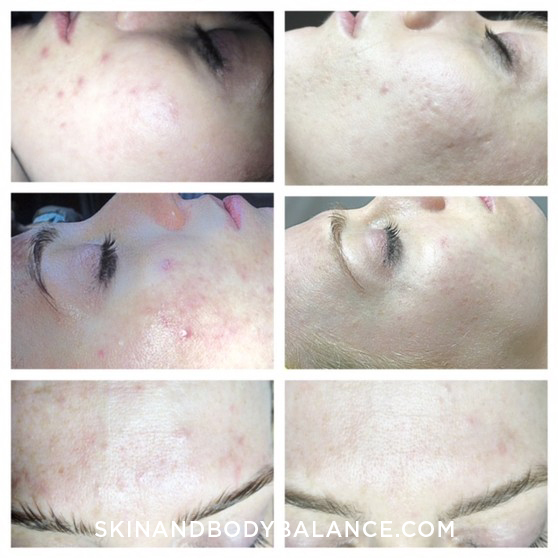 BEFORE AND AFTER WITH SKIN AND BODY BALANCE. Facial including 1 layer of jessner or TCA which is neutralized after 1 to 2 minutes, plus microdermabrasion. 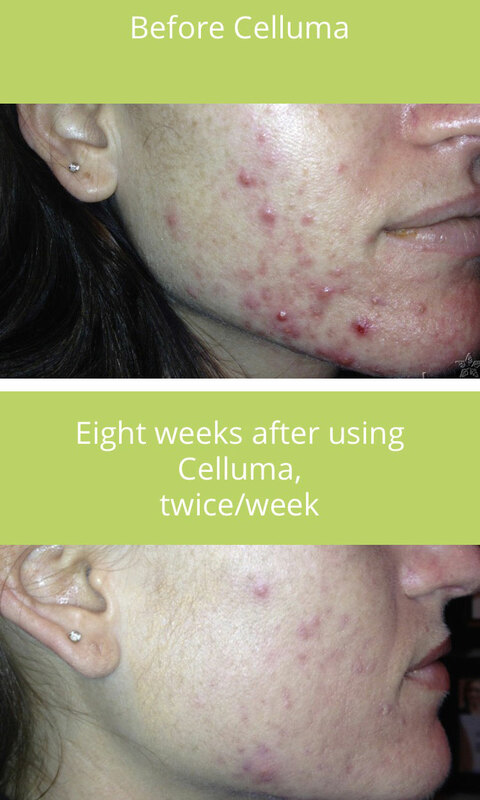 A more intense treatment with little downtime and amazing results! 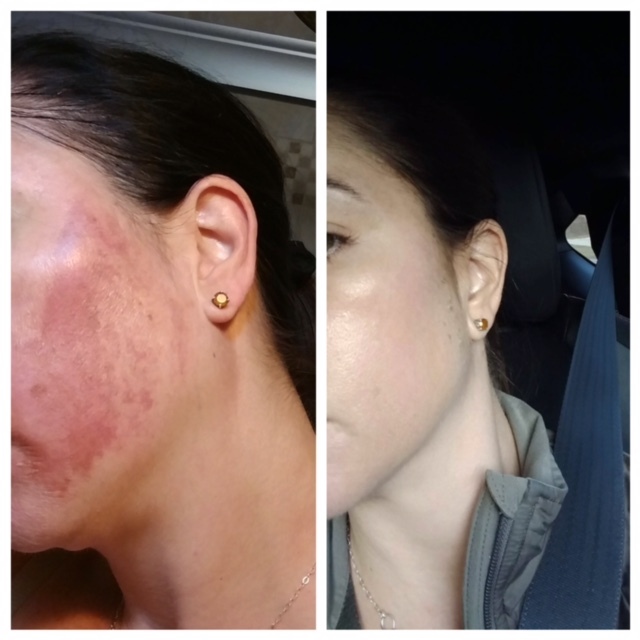 Microdermabrasion (which can be done on a separate visit prior, or the same day of the peel treatment) plus up to 4 layers of jessner or TCA peel solution will be applied. You will go home with this peel and leave it on for several hours before cleansing it off. Expect to peel 5-10 days post – peel. This peel will give you dramatic results – good for reducing hyperpigmentation (age spots), acne and old acne scarring, large pores, fine lines and dull skin. For a quick oxygen boost when you have no time for a full treatment, come in for a peel to soften and tone your skin to keep your skin looking great until your next facial. Quick treatment cleanse, peel (therapist will help choose which type), moisturizer/ SPF included. Soften and treat for youthful looking hands! 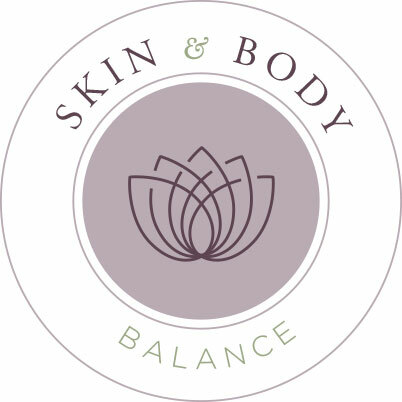 Includes treatment cleanse, exfoliation, peel, serums, moisturizer and hand massage. 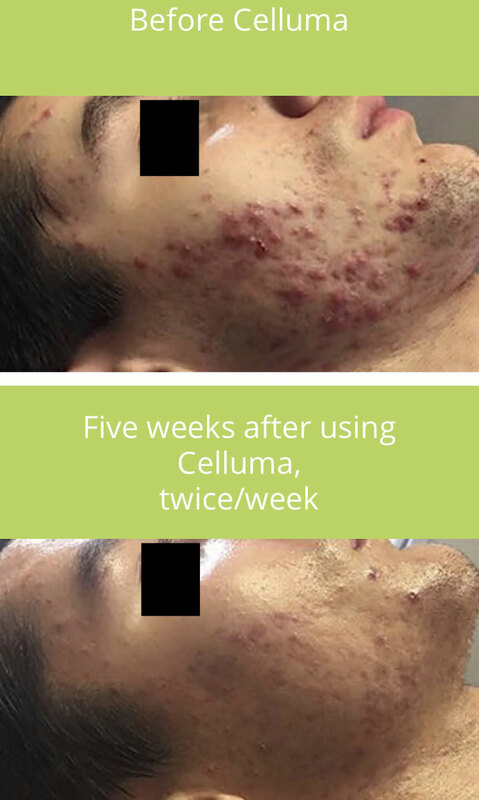 Celluma LED Phototherapy is FDA cleared to treat: wrinkles, inflammatory Acne Vulgaris, diminished local blood circulation, and muscle stiffness and joint pain. Add a 15 minute session to a facial or back treatment for amazing results! Do your eyes look dull and tired? Add on to facial treatment an eye rescue! Wake up, hydrate and rejuvenate! Includes light microdermabrasion and aspiration around the eyes, eye mask, and eye treatment serum. Pucker up! Create a fuller, smoother look with a light microdermabrasion, aspiration and lip treatment. Feeling the urge to pick? Prevent permanent markings and scarring on your face – let the pro take care of it! Quick treatment cleanse, steam, extractions, acne treatment and moisturizer/SPF included. No time for fluff and puff? Maintain your treatments with a quick in-between microdermabrasion. Quick treatment cleanse, microdermabrasion, and moisturizer/ SPF included. Includes deep pore cleansing, hot towels, steam, extractions, mask, serums, moisturizer, plus 10 minute back/shoulder/neck massage. Includes the back facial plus a peel or microdermabrasion. One layer of a peel is included. Extra peel layers are $30 per layer. beautify neck and chest, add to your facial!